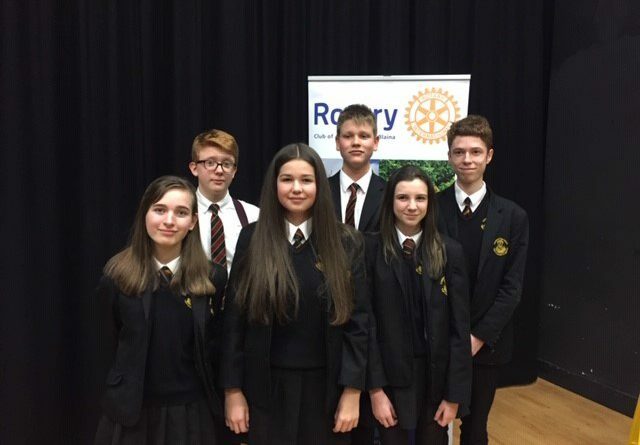 Crickhowell High School had a very successful evening at the Rotary Area Final of Youth Speaks, held at Abertillery Comprehensive School. Pictured are the Senior and Intermediate teams. Two individual awards went to Gabriel Kennedy (best Senior Chair) and Millie Evans (best Intermediate Speaker). In addition, Crickhowell High School also won the best Senior team category and go forward to the District Final to be held at KHS Abergavenny in February. CHS English teacher, Robert Jacob, was in attendance and delighted with the success of both teams. Crickhowell Rotary Club we’re represented by President Ralph Thomas, Stephen Flynn, Dennis Hardwick and Stephen Parry who were all very proud of the pupils efforts.